So I was thinking about black&white wall, but when I look at this it seems really boring, so I choose two colors. 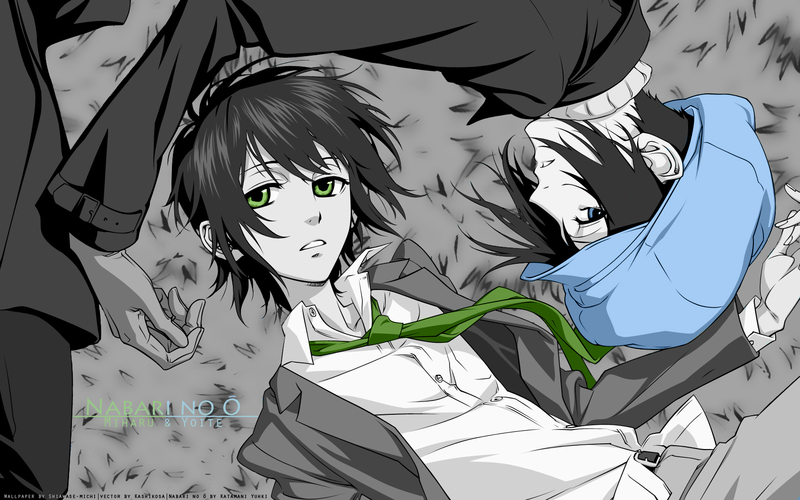 Green for Miharu because is my fav color and I really like him, and blue for Yoite because is my best friend fav color. the featured colour effect works really well, but personally, i dont think the blue is that great, its very similar 2 the green, and perhaps it might be better if they were contrasting colours. just my opinion. I like this wall, nice and simple!^^ Can't complain about the choice of colors, I like them both, and the tones go easy on the eyes. Good! Hm, good job with this. It really catch my eye, thou I'd change the grass thing.. is too.. I want to say blurry but messy covers it. And you have tome jagged lines at the hair, I'm guessing you vectored it at this resolution? Other than that, good job and keep em coming. This is some gorgeous wallpaper. Thanks a lot for sharing. really loved what you did with the colours make it seems so beauti! Well done indeeed! thanks for sharing! I love it but the blue doesn't really fit. In my opinion maybe you should have left Yoite's hat in its original color. But this is really good, thanks for sharing.